Looks chocolate sause~~I like chocolate,of course ice cream,too! The rest of this design…”Cake” and “Pie”. The summer vacation of the elementary school ends a little more, too. The radio gymnastics started for five days from today. We start it at 6:30 AM. The stuff meeting of soccor of son was done last night. And, I spoke drinking with the friend until three o’clock of the middle of the night. This is so beautiful Sachiko! I love the buttons you are using, and your fabric choice is very pretty. 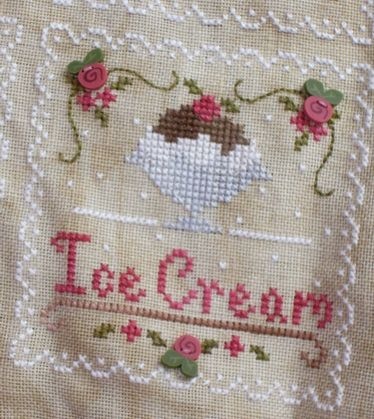 Your stitching is very beautiful! I hope you get to rest today so you are not so tired! It looks good enough to eat! Beautiful! 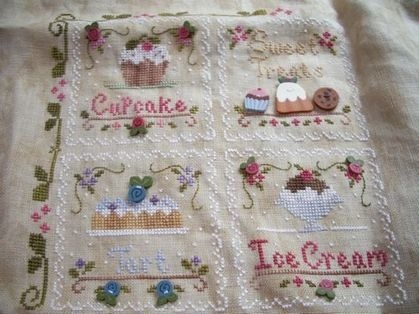 Beautiful stitching, they all look so yummy. Very lovely and I love its colors! Ice Cream is gorgeous Sachiko! Sachiko, please check my blog, you’ve been named. Very pretty. You are almost done with it. Can’t wait to see more. c’est qu’on en mangerait !!!! Ce modèle est ravissant, j’aime beaucoup les petits charms que tu as rajouté et la finition….